Folks that know me probably saw this coming, but Checkers for Android now also has a notation window and full game navigation, just like Chess for Android and, recently, Reversi for Android. All three games have the same look-and-feel again! 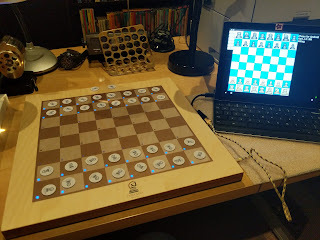 Unlike the algebraic notation in chess or reversi, checkers uses a numbered notation, explained in detail in The Checker Maven (note that, for simplicity of display, my checkers app always just shows the "from" and "to" square for each move or capture, even though technically intermediate squares are sometimes needed to disambiguate multiple jumps). At first glance the numbering may seem a bit confusing, but the notation becomes easier with practice.